A retired CIA officer describes his considerable involvement in the Vietnam War and offers a somewhat self-serving account of the failure of American policy. Allen compares himself to Cassandra, and, if his claims here (vetted by the CIA) are even partially true, the comparison is apt. Not long after the 1954 fall of Dien Bien Phu, Allen (and some unnamed colleagues who agreed with him) began offering to military commanders and politicians and diplomatic officers what they considered realistic assessments of the political and military situation in Vietnam, but no one believed them—or even wanted to hear their generally dark predictions. The author begins with a little personal history. Born in 1926, he saw action in the South Pacific during WWII. Afterwards, he joined the new Central Intelligence Agency and became a specialist in Indochinese affairs. He witnessed the increasing Vietnamese involvement of the US in the early 1950s and credits himself with predicting the assault on Dien Bien Phu (no one listened); he warned his superiors in 1954 that the US should not get involved in Vietnam (no one listened); and he saw the Tet Offensive coming (no one listened). During the 1950s and ’60s he was continually in and out of Vietnam—and, at one point, spent two years separated from his family. He believes that one of our principal failures was permitting the communists to win the ideological and psychological battles with the Vietnamese. 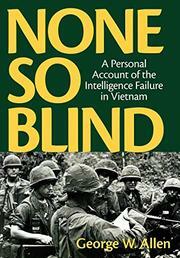 He describes a chaotic situation during the 1960s and ’70s: There was, he says, no coordinated, integrated plan of intelligence among the military, the CIA, and the South Vietnamese—but there was an insatiable hunger for good news from those US leaders prosecuting the conflict, so the naysayers like Allen were gradually marginalized. Allen is no prose stylist: in his hackneyed text, burrs are under saddles, babies are thrown out with bathwater, and feet are held to the fire.